A pop-up exhibition to showcase the work of artists living with disabilities arrives at Cardiff Central this week, before continuing its tour of Great Britain. The travelling art exhibition, No Boundaries, which will be open to the public from 17th September – 6th October at Cardiff Central Station, has been designed to encourage people with disabilities to travel without boundaries. The 20-piece exhibition is made of artwork created by artists with a range of abilities, disabilities, age and artistic experience. The artists involved visited destinations across Britain using a Railcard, which saves customers a third off rail travel, to create artwork inspired by their experiences. Sian Healey (pictured below), from Cardiff, found inspiration for her artwork titled ‘Waiting for the train home after the conference’, her artwork was created using acrylic on canvas. 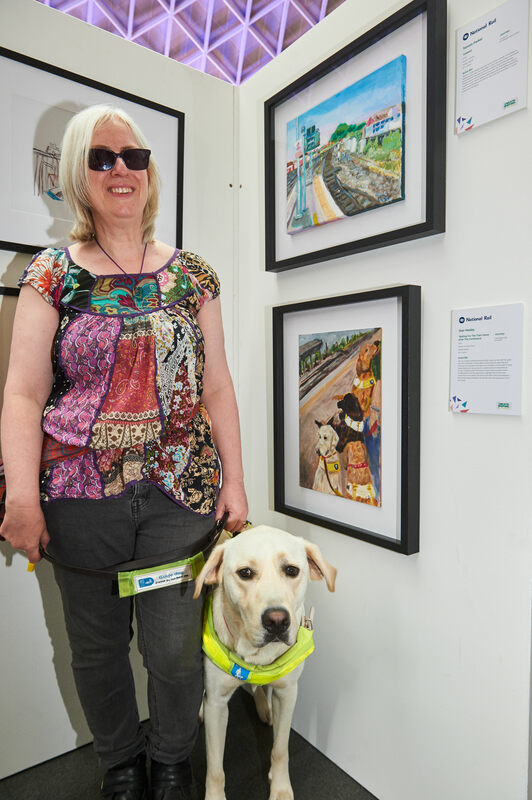 Sian is a Guide Dog owner and visually impaired artist, who is sensitive to light. Before Sian had a family and lived in London she’d try to hide her sight problems, because it made her feel vulnerable. “I love taking photographs and then, when I come home I blow them up big so I can see what has been there through the day. The inspiration for my work comes from attending a conference at Leamington Spa with Guide Dogs. “On the way home there were four of us with Guide Dogs sat on the seats and I thought ‘this would make a lovely painting. I‘d love to do a painting of the dogs and the way they’re sat here’. So, when the opportunity came to create a piece of art for the National Rail No Boundaries exhibition I had a point of creating it. Sitting at that platform together, I thought, was a real celebration of being a Guide Dog owner and the symbol of independence that it brings, and how we can use the rail as our form of travel. For Sian travelling with no boundaries means having a greater sense of independence and highlighting that not all visual impairments are the same. She wants to be able to help more people to feel confident about travelling, and hopes the exhibition will inspire more people to travel when they want, the way they want with ease. As part of this exhibition National Rail teamed up with Guide Dogs, Scope, National Autistic Society, Royal Association for Deaf people, Stroke Association and Whizz-Kidz to generate awareness about the help and support available so that more people can talk and travel without boundaries. 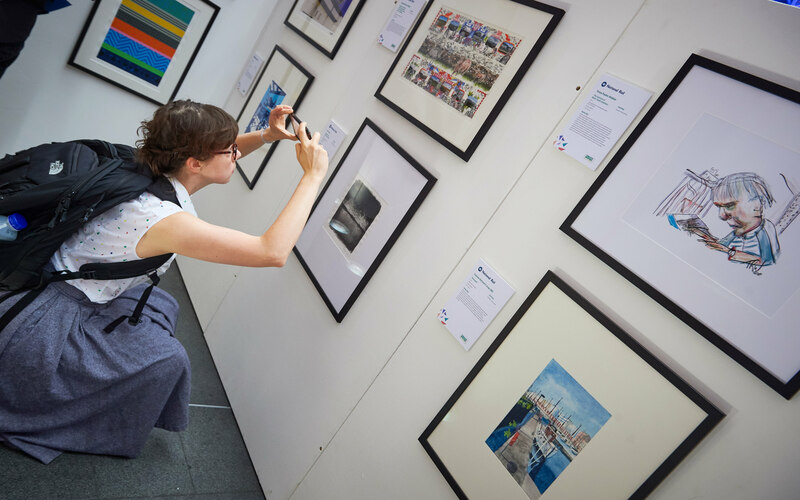 “We’re thrilled to be visiting Cardiff Central Station as the National Rail No Boundaries exhibi tion travels around the country to inspire others to talk, travel and support each other without boundaries. One of the railway’s key commitments is to help more people take advantage of all of the opportunities that travelling by train opens up, which is why the National Rail website offers customers a range of tools and information to help customers plan and book their journeys with ease.